Travis Maddox lost his mother when he was just a child, but as he grew older he always kept her last words of advice in the back of his mind. In college, he lives a life of drinking, gambling, and a new girl every night until he meets Abby Abernathy. When he finally meets the one girl that he has to fight for, he realizes that his mother’s last words were true. Walking Disaster tells the love story from Beautiful Disaster from Travis’s point of view. I was both really excited and really apprehensive about this, because while I loved Beautiful Disaster and was interested in reading Travis’s side, I wasn’t so keen on reading the entire story over word for word. McGuire does a really great job with this–she kind of glosses over the scenes that were already written in the Beautiful Disaster and gives us more scenes that take place when Abby wasn’t around. The book also has a prologue, which tells the story of Travis’s mother’s death, and an epilogue that takes us way past the ending in the first book so that we get to see what the characters are doing later in life. Beautiful Disaster was a pretty controversial book–most readers either loved it or hated it. Abby and Travis have an extremely dysfunctional relationship, but as I’ve mentioned before, I like the way McGuire handles it. When Travis starts acting controlling, Abby backs out or calls him out on it. What’s great about Walking Disaster though is that the reader is able to gain an understanding of why Travis is the way he is. His mother’s death greatly affected him and the way he views relationships, so it is much easier to understand why he makes the mistakes that he does. What is also interesting is that I felt myself being more sympathetic to Travis in this book because reading from his point of view allowed me to realize how back and forth Abby was. Reading from Abby’s point of view and understanding her motives was very different than seeing her through Travis’s eyes–she seems to be sending him all sorts of signals and it’s no wonder he was so confused half the time. I also really liked reading the conversations between Travis and Shepley. I feel like Shepley’s character was more developed because he wasn’t just America’s boyfriend anymore–we get to see more of the role he plays in Travis’s life. While it is not necessary to read Beautiful Disaster first, I would definitely recommend it because Walking Disaster gives the reader a much better understanding of Travis and gives an insight to what was going on with him while Abby was trying to figure out how she felt. I’m glad that this book took it further than Beautiful Disaster did and I think the epilogue provided some nice closure for the story. Overall, Walking Disaster was a really nice followup to Beautiful Disaster and while it told the same story, it gave some new insights into Travis’s character and had a lot of scenes that we didn’t see in the first book. I definitely feel that people who didn’t like Beautiful Disaster because of Travis’s behavior may like it better after reading this because it really helps you to understand why he acts the way that he does. 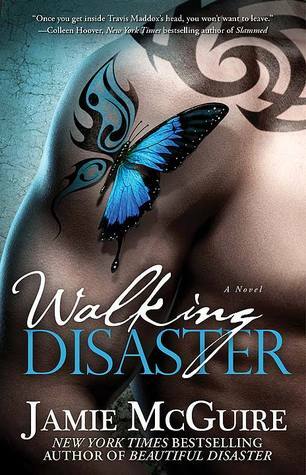 Walking Disaster was released on April 2, 2013 and is the follow up novel to Beautiful Disaster. I believe that a movie is in the works also!